The demand for coding or building software and systems will ebb and flow over time. Thomas Kuhn points out that innovation is not linear, thus the demand for software should be non-linear, too. Fortunately, Engineering and Applied Science is well diversified and in my strong opinion the primary place long-term economic value is created. So, on average, I expect software development to remain an important part of cutting edge industry and research. 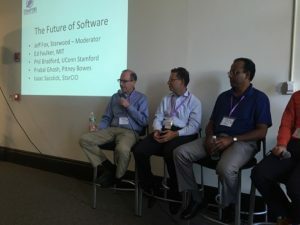 The future of software development has analogies to the previous development of electronic circuit design and applied mathematics. These analogies are not perfect, but give some insight. Circuit design is still important, though it is not as popular as before and many tools help expedite it. On the applied mathematics side, Ronald Graham famously interpreted Goedel’s theorem as indicating mathematics will never be complete (since it must be consistent) so mathematicians will always have good employment prospects. On the other hand, software work-flows and configuration systems appear to be changing the game. These systems seem to trade software development for software configuration. This may diminish software development in certain areas. However, I see this as a Kuhn-like argument. Configuration systems and new high-level languages may slow the demand for software development. However, don’t be surprised as other needs sneak up creating unexpected demand. Furthermore, there will be no official curb on creativity and software is particularly good in expressing creativity.